In the final Super Smash Bros. 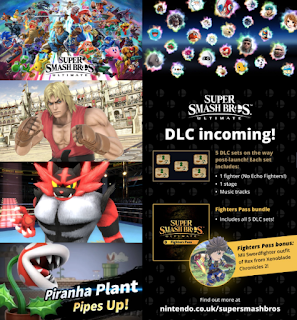 Ultimate Nintendo Direct video presentation before the game launches exclusively for the Nintendo Switch system on Dec. 7, Nintendo blew the lid off of many new modes, fighters and gameplay features of the massive video game crossover event, including details about upcoming DLC. With the reveal of new fighters Ken from the Street Fighter series and Incineroar from the Pokémon franchise, all playable fighters at launch – all 74 of them! – have been unveiled. But more fighters, stages and music tracks will be coming in the form of DLC, which was also announced in the video presentation. To view the Nintendo Direct video in its entirety, visit https://www.nintendo.com/nintendo-direct. Incineroar: The final fighter to join the battle in time for the game’s launch is Incineroar, the advanced evolution of Litten, who made his first appearance in the Pokémon Sunand Pokémon Moon games. Incineroar uses pro-wrestling moves, culminating in an epic Final Smash called Max Malicious Moonsault, based on his Z-Move from the Pokémon games.